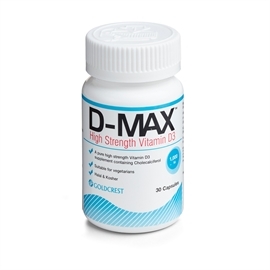 D-MAX Vitamin D3 1000iu is a pure vegetarian vitamin D3 (Colecalciferol) supplement. Vitamin D is an essential vitamin that helps the body maintain healthy bones and teeth. New research suggests that optimum intake levels may be far higher than originally recommended which is why we are bringing you a 10000iu maximum strength all in one capsule.